WELCOME TO MY MONEY MISSION ONLINE: Target: Possibly FREE Popcorn & a Drink! Target: Possibly FREE Popcorn & a Drink! It's Hip to Save! 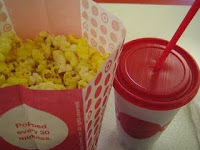 : Target: Possibly FREE Popcorn & a Drink! AWESOME!! Check out the above link....after a shopping ordeal (possibly with children in tow), wouldn't this taste YUMMY!! YIKES! Your Mom Minutes evaporated!!!!!!!! Wait a whole nother (is that a word??) week??????????????? Yesterday was the 15th. I work for accountants. It was like a whole tax season wrapped into one day. And nowwwwwwwwwwwwwww she forgets Mom Minutes. Thank you so much for the links! Much love! I'm off to see how "our" Hobbes is doing....I am just crazy about that cat! You and Helene KILL me with that cat!! Prayers--sheesh! Hey, when is your first competition for band? Ours is next week. I can't wait!! I've got my gloves, winter coat, and hat all ready! It will probably be 85 degrees.